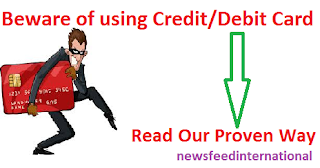 In This Growing World, Most Of People Use Credit/Debit Card. Most Of them are using Online Banking System. Bank Authority Give Us a Credit/Debit Card for our life makes it easy. We maintain this kind of card for our Growing Life to make Flexible. Be Careful Of Using Credit And Debit Card Hacked from others. Somehow Credit/Debit Card got hacked or misuse. They Take Our Money by using our Card, most probably using Malware to ATM Machine. When We Swipe Or Use Our card They Got Our Pin and then They Just Vanished Our precious Money. When You Press Your Pin Keep Its Hide. If you face any kind of problem, Like Card Stuck in Machine and a signal and you are Received Money. In this Situation Quickly Inform Your Bank Authority. Change Your Card Pin Frequently In a Week. Do Not Use Unknown Person Help When You are In ATM Booth or any other Area. Cancel Your Transaction Details When You are Done. If You Lost Your Card Go To Bank and Blocked Your Card so that It's not suitable for Others to use. Do Not Use Transaction Slip To know your Balance better you see it in your ATM Display. If you used your card to pay your shopping/petrol pump then Don't Get it to your eye Sight. Do urgent Step To File Your Mobile Number and email Id attach with your account to know your every Transaction Details. Don't Miss Any Of your Bank Sms. Read There Sms So Carefully. Don't Share Your Pin to any other. Make it sure that when you press your pin to ATM machine keyboard That its Original. Also Don't use your Credit Card Details in Low Ranked Shopping or any other site. Now Adays Hackers Send You a link if you click this link they Got Your PC in their Hand. before Clicking any of this link make sure at first that this Link is not harmful to you. Hackers are so smart to hide it from Police. they using Upgrade Technology. So everyone tries to Careful about your Credit or debit Card Using.